Home Full Timing	Choosing an RV Name – How Did We Choose Ours? 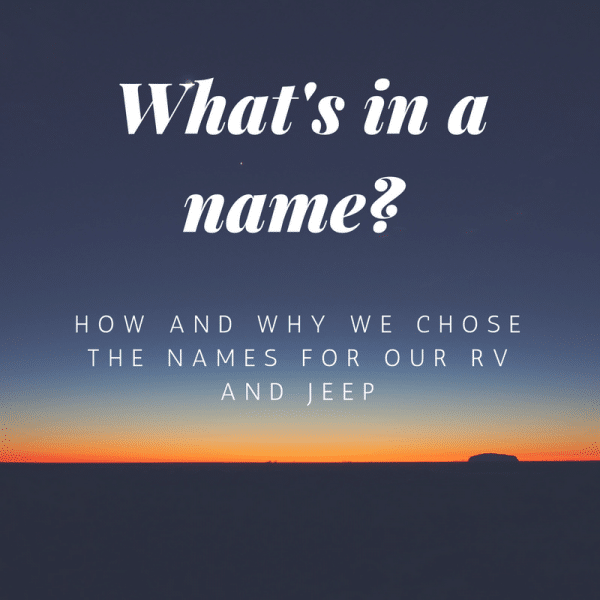 Do you ever wonder what is in an RV name? Most full timers (and even many weekenders/part time RVers) give their rigs some kind of RV name. Often they name their RV after something that rhymes with the brand of their rig, or from the color scheme (like “Big Browny”). Others have paired names for their truck and trailer or 5th wheel (like The Freedom Theory’s Rocky and Bullwinkle). Our first rig was called Boomer. In retrospect, most people probably thought we were Baby Boomers (which we aren’t). But Boomer comes from the Australian word “Boomer” for a male kangaroo. The name worked for our first rig, but we didn’t want to use it again for our new RV. For our full time life rig, we wanted to have names for both the rig AND the Jeep we are towing, so something that worked for both. In case you missed it, I (Sonya) am Australian. We both embrace my heritage and like to “fly the flag”, so to speak for both Australia, and the US. So when it came to naming our rig, we thought about names from both cultures, and decided to pick something from the Australian culture. “Waltzing Matilda” is Australia’s best-known bush ballad, and has been described as the country’s “unofficial national anthem”. The title was Australian slang for travelling on foot (waltzing, derived from the German auf der Walz) with one’s belongings in a “matilda” (swag) slung over one’s back. The song narrates the story of an itinerant worker, or “swagman“, making a drink of billy tea at a bush camp and capturing a stray jumbuck (sheep) to eat. When the jumbuck’s owner, a squatter (wealthy landowner), and three mounted policemen pursue the swagman for theft, he declares “You’ll never take me alive!” and commits suicide by drowning himself in a nearby billabong (watering hole), after which his ghost haunts the site. 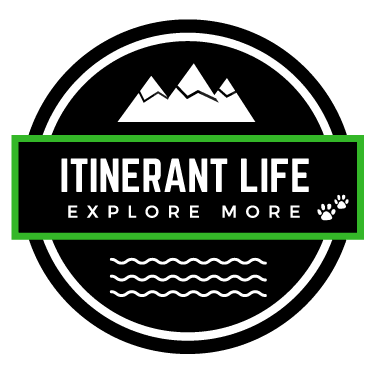 Our RV Life name is “Itinerant Life”, so as soon as we read the description, it made a whole lot of sense to us! So we gave our RV the name “Matilda” and our Jeep “Swagman”. We are travelers, workers, explorers, itinerants. It just fit. Matilda might be shortened to Tillie, and Swagman Swaggy or something, because all Aussies tend to shorten our words 🙂 But let’s just hope we don’t have the same ending that the Swagman has in the ballad! So what do you call you call your RV or car? Share in the comments below! And we would love to hear your thoughts on our names… Happy travels! Anyway, I am jealous of your Phaeton. Those are gorgeous RVs. We’ve loved our Tiffin and hope you guys love yours as well! Barney is awesome ! We had a purple motorcycle that I called Barney too 🙂 Can’t help it ! Tiffins are awesome. We looked at Allegros but the Phaeton became available and we jumped on it:) Happy travels in Barney! !